Mort Kunstler Handsigned and Numbered Limited Edition Giclee on Canvas:"Battle for St. Augustine, 1702"
About the Art: This is a dramatic episode from the struggle for the American continent, one that portended the final struggle between the Spanish- and the English-speaking peoples, which assigned the Floridas to the United States. As early as the 1600's Charles II granted the Carolinas, Georgia, and much of Florida to the Earl of Clarendon and his associates; soon the English had established flourishing settlements in the Carolinas. With the outbreak of the War of the Spanish Succession - called Queen Anne's War in America - the Carolina Assembly authorized an expedition to seize St. Augustine before it could be captured by the French. 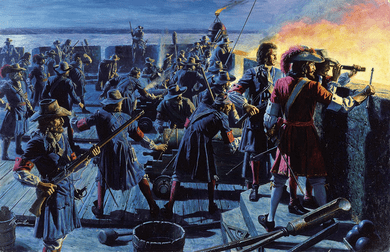 In midwinter, 1702, a mixed force of some five hundred Carolinians and Indians attacked St. Augustine. They burned the town but found the fort impregnable - so impregnable that the Spanish never used their cannon except in the vain attempt, pictured here, to curb the fires that threatened the town itself. In 1762, the British captured Havana and the next year exchanged Cuba for the Floridas. Yet Spanish control was ended only temporarily. During the American Revolution, Spain associated herself with the successful rebels and by the second Treaty of Paris, 1783, was rewarded by repossession of Florida. This was to prove intolerable to the new American republic. In 1810 Americans launched an attack on West Florida and President Madison promptly proclaimed its annexation to the United States. A few years later General Jackson was authorized to pursue hostile Seminole Indians in East Florida. "Let it be signified to me throughout any channels," he wrote, "that the possession of the Floridas would be desirable to the United States and in sixty days it will be accomplished"; and soon it was - though not quite in sixty days. In 1819 Spain was forced to sell the Floridas to the United States for five million dollars (a good bargain, since all the money was applied to settle American claims against Spain!). So ended three hundred years in which Florida was a pawn in the struggle for a continent.